There are more electric vans in the marketplace at the moment than ever. “So, is it time your business traded in that traditional diesel load-lugger for a zero-emissions one which runs on pure voltage? Driving an electric van is a virtually noiseless experience, save for a faint high-pitched whirr from the motor. There’s no CO2 coming out of the exhaust pipe either, so you can trundle around from job to job, safe in the knowledge that you’re not actively contributing to global warming. NO: Are they really that clean? You have to charge an electric van for eight hours to achieve a full battery (though this is significantly quicker when using a rapid charging station), using a specialist bit of kit that you have to buy at no little expense. Nissan’s e-NV200 is the current class leader in the electric van market. When it arrived in the UK last year the entry-level Acenta version was made available at an eye-catching £13,568, with a £61 per month battery rental fee (it’ll cost £16,737 to own the battery outright). That’s roughly similar to a diesel-powered version. The government will even pay 20% of an electric van’s value, up to £8,000. What’s more, servicing costs are low and you’ll dodge a bunch of sundry running costs, like the London Congestion Charge. NO: Will it be worth much in a few years? If the electric car marketplace is anything to go by, electric vans may well be subject to truly horrendous depreciation. Examples of the Nissan Leaf, which shares underpinnings with the e-NV200 have been sold second hand for half their list price just a year after going on sale. That said, you may well find that it’s worth biding your time to snap up a used bargain when the market matures. 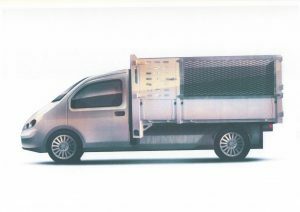 There still aren’t electric versions of larger vans yet, including big-selling vans like the Ford Transit and the Volkswagen Transporter and Caddy. There’s also not much of a second-hand marketplace to speak of yet. What better way than to wow your clientele than by very visibly (but not audibly) rocking up to a delivery in an electric van, demonstrating your caring, sharing green credentials? The big issue when it comes to electric vans is range. You won’t get nearly as much from a full-charge as you would a tank of diesel, and you’ll find that air-conditioning, hills, heavy loads and a heavy foot will sap your battery before you can say ‘carbon footprint’. While there are lots of charging stations dotted around the UK (6,500 as a matter of fact), there’s no arguing that charging up isn’t nearly as straightforward as filling up with diesel. While electric vans make many compelling cases – particularly if you operate in and around London – we can’t help but think it might be worth biding your time for the technology to evolve. Diesel vans are cleaner than ever, and you can make significant reductions in how much diesel you use by changing your driving style and maintaining your van properly. Of course things have moved on a bit in two years, with longer range vehicles and larger delivery vans available. Make sure you contact us with your questions about our stock and visit us on LinkedIn and Facebook too, to follow our business pages for news on the industry! !